Mumbai, Maharashtra, India: The year was 1957 when Ayn Rand's magnum opus, Atlas Shrugged, took the world by storm. The prodigious hero John Galt's fight against the establishment struck a chord with all innovators across the world as they faced resistance from the mediocre system. Sixty years on, and the legend of John Galt continues as one more innovator finds himself in the clutches of the high and mighty who were unable to digest his meteoric rise to the pinnacle of stardom. The innovator is none other than Jignesh Shah, the founder of Financial Technologies, also known as the poster boy of Indian financial markets for putting India on the global map through his 10 world class exchanges. The visionary Shah is credited with revolutionising our markets by introducing cutting edge solutions and ingenious technologies way ahead of time. But his enemies in power who wanted to protect their monopoly in the markets have tried their best to crush this 'Made in India' dream. 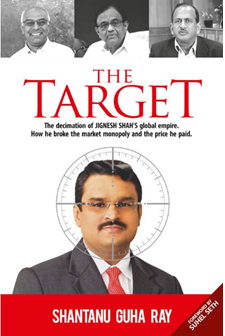 To know how India's John Galt was targeted, 'The Target' by Shantanu Guha Ray is a must read! Shantanu Guha Ray latest instalment ‘The Target’ has been hailed to strike a chord similar to the Ayn Rand magnum opus, Atlas Shrugged. Shantanu Guha Ray showcases his penmanship on how an innovator, who achieved the best for the financial sector, was brought down by the influencers &amp; bureaucrats.